The 7th Annual O.R.G. Benefit was October 25, 2009. World-renown shark biologist Dr. Greg Skomal presented Ocean travelers: tracking the world's biggest sharks. This presentation highlighted the efforts of the Massachusetts Shark Research Program to study the ecology and life history of the world's largest sharks. It centered on the use of new technologies to examine both the fine and broad scale migrations of basking, Greenland, great white, porbeagle, and whale sharks from the warmest seas to the coldest oceans around the world. Greg also signed copies of his new book The Shark Handbook. Jonathan Bird presented new never before seen segments from the new season of Jonathan Bird's Blue World. The 2009 O.R.G. scholarship was presented, and of course there were plenty of raffles, door prizes, and auctions including a dive in the Giant Ocean Tank at the New England Aquarium! 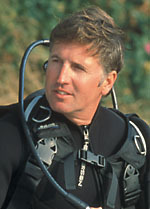 Dr. Gregory Skomal is an accomplished marine biologist, underwater explorer, photographer, aquarist, and author. He has been a senior fisheries biologist with Massachusetts Marine Fisheries since 1987 and currently heads up the Massachusetts Shark Research Program (MSRP). He is also adjunct faculty at the University of Massachusetts School for Marine Science and Technology in New Bedford, MA, a guest investigator at the Woods Hole Oceanographic Institution in Woods Hole, MA, and an adjunct scientist with the Center for Shark Research in Sarasota, FL. He holds a master’s degree from the University of Rhode Island and a Ph.D. from Boston University. Through the MSRP, Greg has been actively involved in the study of life history, ecology, and physiology of sharks. His shark research has spanned multiple fish habitats around the globe taking him from the frigid waters of the Arctic Circle to coral reefs in the tropical Central Pacific. Much of his current research centers on the use of acoustic telemetry, satellite-based technology, and animal-borne imaging to assess the physiological impacts of capture stress on the post-release survivorship and behavior of sharks. He has written dozens of scientific research papers and has appeared in a number of film and television documentaries, including programs for National Geographic, Discovery Channel, ESPN, and numerous television networks. He has been an avid SCUBA diver and underwater photographer since 1978. Although his research passion for the last twenty-five years has centered on sharks, he has been an avid aquarist for over thirty years having written eleven books on aquarium keeping. His most recent book, The Shark Handbook, is a must buy for all shark enthusiasts. His home and laboratory are on the island of Martha’s Vineyard off the coast of Massachusetts. WHEN: Sunday, October 25, 2009 at 1 PM. WHERE: National Heritage Museum, Lexington, MA. WHY: To raise money for the O.R.G. Marine Science Scholarship Program! Can't attend the event but would like to help the cause? Make a donation! All images on these pages copyright ORG, Inc..